Tonight we dined at a (self proclaimed) "World Champion BBQ" restaurant called Whole Hog Cafe. And boy, was it yummy! If you have ever talked to my husband for more than 5 minutes, he has probably brought up the fact that he loves barbecue. In fact, he has probably suggested you go eat barbecue together. 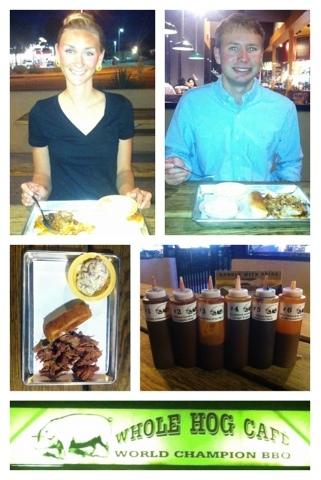 From MoJos, to Slows, and now Whole Hog Cafe - the man loves his pulled pork and macaroni... So this was right up his alley.